The John F. Kennedy Special Warfare Center and School - the Army's special operations university - is responsible for special operations training, leader development, doctrine, and personnel advocacy. The center and school's Training Group conducts the complete spectrum of special operations training. In addition to its training role, the school also tests new equipment. The Special Warfare Center and School began as the Psychological Warfare Division of the Army General School at Fort Riley, KS, in 1951. The school moved to Fort Bragg in 1952. Civil-affairs classes were added to the curriculum when the Civil Affairs School moved from Fort Gordon, GA, to Fort Bragg in 1971. In 1961, the school established the Special Forces Training Group to train enlisted volunteers for assignments in special forces groups. The Institute for Military Assistance at Fort Bragg, NC, was, on 1 October 1983, redesignated the JFK Special Warfare Center, as a result of a special operations forces (SOF) realignment of that year. The JFK Special Warfare Center was in essence a branch school, but was categorized as a TRADOC special activity. 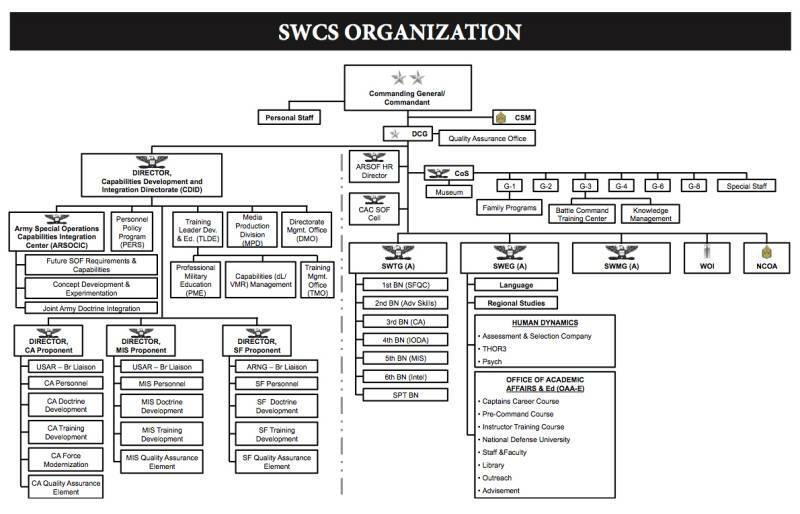 Further SOF realignments in 1990 transferred the TRADOC school to the U.S. Army Special Operations Command at Fort Bragg, by orders of 20 June. 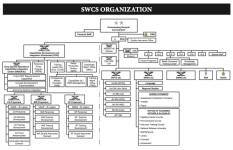 The school's Joint Special Operations Medical Training Center, established in 1996, consolidates and standardizes all SOF medical training within DOD. In all, the school trains more than 10,000 U.S. and foreign students, yearly, in 68 programs. The legendary green beret and the special forces tab are symbols of physical and mental excellence, courage, ingenuity and just plain stubbornness. And the only place to get them is at the U.S. Army John F. Kennedy Special Warfare Center and School at Fort Bragg, NC. At the heart of special forces training is the 1st Special Warfare Training Group, which conducts the Special Forces Assessment and Selection Course, Special Forces Qualification Course and all advanced special forces skills training such as language training and regional studies. The first step for a soldier wishing to become Special Forces qualified is Special Forces Assessment and Selection; a 24-day course designed to focus on student trainability and suitability in Special Forces. The SFAS cadre look at nearly 1,800 Special Forces volunteers each year to determine who is suitable for Special Forces training and to determine who may be unable to adapt to the Special Forces environment. Candidates attend SFAS at Camp MacKall, N.C. in a temporary duty (TDY) status. Candidates who enter this course find themselves under constant evaluation starting with the day they in-process until the day they out-process. Teaching, coaching, training and mentoring are important aspects of the program. Land navigation is used as a common medium to judge student trainability. A series of 12 attributes linked to success in the Special Forces Qualification Course (SFQC) form the basis for evaluating candidate suitability. These attributes include intelligence, physical fitness, motivation, trustworthiness, accountability, maturity, stability, judgment, decisiveness, teamwork, influence, and communications. Though land navigation is an important evaluation tool, other training events such as a one-mile obstacle course, runs, road marches and rappelling are also used to evaluate students. A board of impartial senior officers and noncommissioned officers reviews the soldier's overall performance during the course. It makes the final determination as to whether the soldier is suitable for Special Forces training and identifies the specific Special Forces military occupational specialty for which he will be trained. After successfully completing the Special Forces Assessment and Selection Course the soldier is then eligible to attend the Special Forces Qualification Course. The 1st Special Warfare Training Group (Airborne) is responsible for the six-phase Special Forces Pipeline training. To accomplish this mission the Group divides the responsibility into several battalions. The 1st Battalion is responsible for all field training in the SF Pipeline. The 3rd Battalion conducts language training and 4th Battalion conducts all military occupational specialty (MOS) training. Company B, 2nd Battalion, operates the Military Free Fall SChool. Company C, 2nd Battalion, operates the Special Forces Underwater Operations School in Key West, FL. The United States Army Security Assistance Training Management Training Organization [USASATMO] is a TRADOC organization attached to the U.S. Army John F. Kennedy Special Warfare Center and School, Ft. Bragg, NC. Security Assistance (SA) evolved under a tradition of cooperation between the United States and other sovereign nations with similar values and interests in order to meet common defense goals. It consists of a group of programs authorized by the US Foreign Assistance Act, the Arms Export Control Act and related statutes by which the US provides defense articles and services in furtherance of national policies and objectives. USASATMO is the Army organization responsible for deploying Army-managed training and technical assistance teams to OCONUS locations worldwide in support of SA missions. USASATMO's mission includes forming, preparing, deploying, sustaining and redeploying, SA teams composed of soldiers and civilians drawn from CONUS Army organizations. USASATMO is authorized direct coordination with CONUS and overseas commands and has broad tasking authority over all CONUS-based Army assets. U.S. Army Yuma Proving Ground (YPG) is a general-purpose desert environmental test facility. YPG is located 26 miles north of Yuma, Arizona on U.S. Hwy 95. This installation covers nearly 1,400 square miles and offers climate and terrain similar to major desert areas worldwide. YPG is primarily involved in developmental and operational test of artillery weapons and ammunition, aircraft armament systems, mobility equipment, and air delivery systems. The U.S. Army Health Clinic and the Military Free Fall School, part of the John F. Kennedy Special Warfare Center, are tenant organizations. The John F. Kennedy Special Warfare Center and School's Special Forces Underwater Operations School in Key West, FL, provides Special Operations training centering around maritime operations and infiltration techniques used to infiltrate enemy areas to avoid detection. The school offers three specific courses related to underwater operations: the Special Forces Combat Diver Qualification, the Special Forces Diving Medical Technician and the Special Forces Combat Diving Supervisor. In 2011, the Directorate of Regional Studies and Education received authorization to be formed into a formal unit. On 1 May 2012, Headquarters and Headquarters Company, Special Warfare Education Group (Airborne) was formally activated.